BMW Forecasts Cars Will Be Highly Automated by 2020, Driverless by 2025. The latest in a slew of press from major automakers, BMW and automotive supplier Continental recently announced a partnership to develop new technology for self-driving cars. 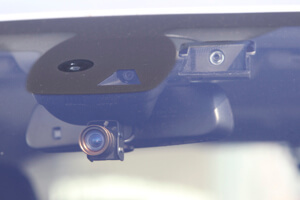 The collaboration aims to develop an “electronic co-pilot” system for highway grade driverless cars over the next year. 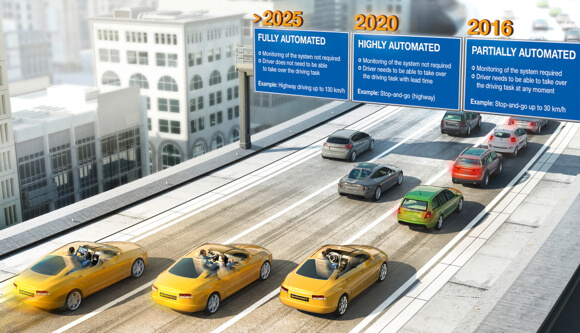 And the announcement came with a bold forecast: partially automated cars by 2016, highly automated cars by 2020, and fully automated cars by 2025. During their year-long partnership, BMW and Continental will build and test several prototypes using near-production technology—stereo cameras, radar, and laser sensors. Researchers will then run the prototypes through many of the tests modern freeways have to offer, navigating the likes of toll plazas, construction, and interchanges. They’ll use the trials to further hone their algorithms, and prepare the system for real world use. This isn’t BMW’s first foray into automation by any means. Three years ago, the iconic automaker sent a driverless car around Nurburgring North Loop and later raced it at Laguna Seca in the US. In 2011, BMW drove (or rather, didn’t drive) an automated car on the A9 in Germany. The car has since logged 10,000 incident free kilometers without human intervention. Beyond BMW, other commercial automakers gunning for full automation include Audi and Mercedes. Meanwhile, Stanford’s robot Audi is challenging the best human drivers on the racetrack. And BMW’s 10,000 kilometer trial pales in comparison to the Google car’s 300,000 miles. Given the competition—that 2025 forecast may prove too conservative. The technology is already here. The major roadblocks will be legal, regulatory, and human. It may take some time for drivers to feel comfortable giving up control and believe the roads are more safely navigated by emotionless algorithms capable of making life and death split second decisions. Perennially unimpressed Peter Thiel famously complains, “We wanted flying cars, instead we got 140 characters.” But technology doesn’t always deliver the expected, and it rarely does so on schedule. George Jetson’s car could fly—but could it fly itself? I don’t think so. We’ll have mass produced, fully automated cars well before the flying variety ever make an appearance. And maybe that’s as it should be. Never mind the challenges of building airborne passenger vehicles—think of the skills required to fly them. For humans to take to the air en masse, it may be better to have a computer at the helm.